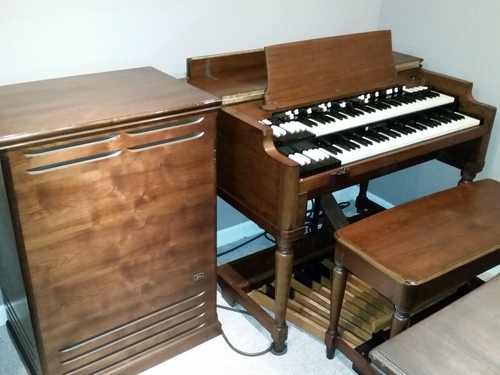 We sell preowned Hammond Organs, such as the Hammond B3, and Leslie speakers all over the U.S. Areas that frequent our showroom are Atlanta, G.A., Nashville, T.N., Greenville, S.C., Columbia, S.C. Roanoke, V.A., Danville, V.A., Martinsville, V.A., Asheville, N.C., Western N.C. , Hendersonville, N.C. Bennettsville, N.C. Rock Hill, S.C., Florence, S.C., Wilmington, N.C., Fayetteville, N.C. Ashville, N.C. Some customers drive long distances to get the quality they need: Richmond, V.A. Washington, D.C. Memphis, T.N. Knoxville, T.N. Beckley, W.V. Savannah, G.A., Augusta, G.A., Marietta, G.A. Athens, G.A. Macon, G.A. Johnson City, T.N., Chattanooga, T.N. , Charleston, W.V. Huntington, W.V. Virginia Beach, V.A. Norfolk, V.A.